Oklahoma State’s best efforts on the field against Oklahoma were not enough, as even the Bedlam beatdown of the Sooners was not enough to overtake the Alabama Crimson Tide for the second spot in the BCS and the right to take on SEC Champion #1 LSU for the 2012 BCS National Championship. Criticism of the BCS has kicked into high gear since news started to leak Sunday afternoon, but there’s not much to really do until the BCS expires in 2013. The system allows for the Coaches and Harris Interactive Polls to dictate some of the maneuvering – one coach had the Cowboys ranked fifth (FIFTH!) in the nation, therefore pulling the further behind Alabama – and so we’re left with a rematch of SEC West powers that highlighted this season with their first head-to-head game in November and will finish the postseason schedule two months later with the BCS Championship Game in New Orleans. The pairing guarantees the Southeastern Conference’s sixth straight BCS title, so testing the SEC’s title of Best in the Nation will have to wait another year. The Big Ten (specifically Ohio State) has tried and failed twice to unseat an SEC program during the conference’s run of success, as has the Big 12 (Oklahoma and Texas). The Pac-10 got a chance last year (Oregon) and fell short, leaving voters to think that only an SEC school could win this season, as well. Oklahoma State will not get the opportunity to redeem its now-shorthanded conference, and will instead take on Stanford in the Fiesta Bowl. But we’ll get to that later this week. But take the voter’s assumption about the SEC being best with at least one caveat. Aside from LSU’s out of conference victories against two BCS-bound schools (Pac-12 champ Oregon and Big East co-winner West Virginia), who exactly did SEC teams beat outside of their conference to assert their perceived dominance this year? Alabama defeated then-#23 (and now #22) Penn State on the road, though the Nittany Lions were 0-3 against ranked teams this season. South Carolina defeated ACC Champ Clemson in their season-ending rivalry game, and Arkansas managed to mount a steep comeback to beat Texas A&M… a team that finished its year 6-6. Three “notable” wins by 11 teams in a power conference just seems a bit lackluster, doesn’t it? None of this is suggesting that, in the end, Alabama couldn’t possibly deserve the #2 ranking and a spot in the BCS Championship. It’s just worth seeing the SEC’s resume in a broader perspective so you can gauge the fairness of the system for yourself. Regardless of how we got here, an all-SEC title game between LSU and Alabama (led by a guy who knows something about winning national titles at both Alabama AND LSU, Nick Saban) in New Orleans is going to be a rocking good time. All of those alumni and former star players from these traditional powers descending on Crescent City a month before Mardi Gras is going to be a sight. About that, college football fans, there is no doubt. BCS Championship Game tickets will give 76,000+ folks at the (now sponsored) Mercedes-Benz Superdome a chance to see an SEC West rivalry revisited with #1 LSU vs #2 Alabama January 9, 2012. This season’s first matchup of these two teams saw the defenses give their best and a 6-6 tie at the end of regulation. Despite the fact both teams had average over 40 points per game leading into the first game, no touchdowns were scored and LSU won in overtime with a field goal and 9-6 final score. Since then, LSU coach Les Miles has kept his team pushing forward, dominating a potent Arkansas team on Thanksgiving weekend and accepting the extra challenge of defeating the Georgia Bulldogs on Saturday for the SEC title. A slow start and 10-0 deficit was erased by the Tigers’ aggressive defense, strong running and the electrifying returns of cornerback Tyrann “Honey Badger” Matthieu. Alabama closed its season strong, as well, winning its final three games by an average margin of 37-14 behind the dominating performance of Heisman candidate Trent Richardson. Coach Saban spent last week, effectively a bye for the Crimson Tide because they didn’t qualify for the SEC title game, campaigning for his program’s talent and deserving case to be in the title game. While the political spin may put some folks off, having your only loss of the year come in a game with the #1 team in the country is a convincing-enough approach for many who find it easier to debate over a few losses instead of the quality of multiple teams’ (and conferences’) slate of victories. The Tigers and the Tide are rolling into New Orleans for New Years and into millions of homes that will tune in to watch the BCS National Championship game. If you would rather be on the ground for all of the fun and excitement LSU vs Alabama can offer in the SEC’s backyard, check out SeatGeek’s listings from all of the best ticket sites on the internet and rely on the Deal Scores to help you find the Best Value for BCS Tickets. Here are a few highlights to get you started. – With the BCS standings now official, BCS Title tickets are skyrocketing. The best deals currently cost $1499/ticket in the Terrace West Zone (Upper Deck, corners of the field), $1750 for first-level Plaza seats (also in the corners) and $1766/each for Upper Deck seats between the 30 yard lines. 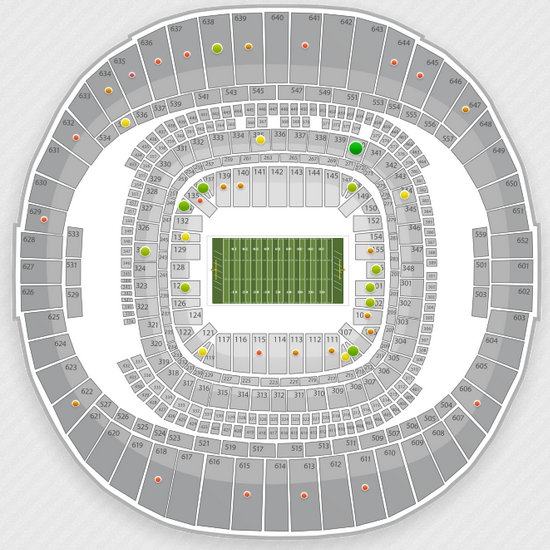 – The cheapest seat currently listed for $1466, also in one of the Terrace corners (section 632). We’re a month away and already over 12 times the face value of some of these seats! – Want to buy in bulk? 400-level suites (the higher of the two Superdome luxury segments) can house you and 44 of your closest friends for $217,365 – only $4,831 a ticket. If you only have 24 such friends, move down to the 300-level suites for only $142,500 – or $5,700 each. Now that, friends, is a party. Can Alabama redeem itself from the November loss, or will LSU reaffirm its place far atop the college football landscape? If Alabama happens to win another close, low-scoring contest, is it possible LSU will have enough points and votes to STILL be #1 and champion in the final season rankings? These teams have a month to prepare, so we’ll see. If you’re using the month to find BCS Championship tickets and have questions, check us out on Twitter @SeatGeek or write chad@seatgeek.com. Happy Bowl Season! Every year the two top ranked college football teams go head to head in the BCS National Championship Game as determined by the BCS Rankings System. This year, the clash of college footballs elite will go down on Monday January 9, 2012 at the Superdome in New Orleans, Louisiana and we have all the 2012 BCS Championship tickets aggregated and sorted by best deals right here at SeatGeek, as well as info on the lottery process and ticket prices. It’s December 2nd, and while nothing is written in stone, odds say for the 2012 BCS Championship Game we’ll be seeing a rematch of the November 5th game between LSU and Alabama (LSU won 9-6 in OT). For those of us annoyed with the BCS ranking system, there is still a chance Oklahoma State makes the BCS Championship Game – but it’s not likely. – to see charts for all pricing levels check out the BCS’s full pricing table. This new system looks to ensure that the die-hard fans have the chance to see their team play. However, it also exploits these fans by forcing them to buy an asset which will most likely have a value of zero at the end of the season. To purcahse your ticket reservations, head over to the BCS National Championships Game site and pick your favorite team. If you are interested in big time college sports, you should also check out our coverage of this year’s Final Four in New Orleans.